Hi chaps, Mr Accamazzo in particular. I started ice-climbing with a Chouinard Frost - 60cm with a very pale wood handle(hickory or ash??) 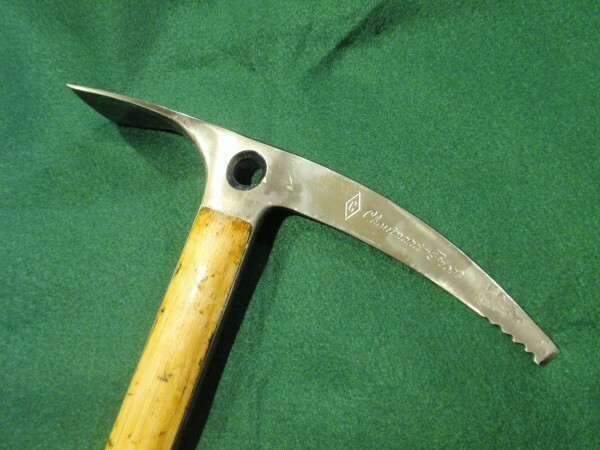 and a dinky little Salewa ice hammer (T shaped cross section for the pick!) Climbed things like the Chancer and Devil's Delight and Point Five and Zero and they worked fine. For me, though, Terrors were the bees knees ... great except for the bashed knuckles. If you got the rather odd swing correct - a downward pull with the knuckles hammering the ice - they worked great. Did the 2nd ascent of Bridalveil with your Mr Shea using terrors - that was fat, steep ice, was it not? Pick was way too soft, mind, and wore out very quickly. They had a tendency to stick, so we sharpened the top edges of the picks to 'cut' up and out. The axe was brilliant for going over the top of a bulge into powder snow but too light for hard ice. Often we carried two hammers and an axe, or at least THEY did - the folk with any money (not me). In 1978 I got hold of THE prototype Chacal from Luger Simond - He was going to make a straight drooped pick but I held the shaft of the axe while he cut holes in an ordinary curved pick blank reversed. Then he cut teeth and changed the angle of the end of the pick to make a point to penetrate the ice and lo, the first reversed banana pick. Worked brilliantly!! I still have my Dachstein mitts from the mid seventies, though I had to fight off the wife when she wanted to wear them to paint the house walls! Best mitts ever!! Look up the "wee jock" user name. Stuff is a lot like Jello's, Bachar's and some of the others posting here for historical importance. I was still climbing with my Chakal and a cassin anteres knock off chakal in 99.. I used terrors as well in those days. Two hammers and carried a short axe for backup, adze work and descending. Some of us got connected with Charlet in our Chamonix days and got customized Gabbarou Cascade tools which worked pretty well. I ditched the Chouinards after breaking some; ditto with the useless Hummingbirds. Birds were especially bad if you hit even a pebble, too soft at the tip edge yet felt brittle imho. Sometime in ‘75 (‘76?) North Face opened a retail store in downtown Seattle. I dropped by as they were still organizing. In the pile of unorganized stock I spotted two NOS ‘72 version 80 cm hickory Chouinard Piolets, still in their plastic bags. I bought them (only were two) and sold them to a couple of my old school climbing partners. Upon request I cut one down to 70cm and the other to 75. The 70 went to Mt. St. Elias, Peru and beyond and last I saw it the pick was much shorter. The 75 is sitting in a living room in Bremerton in company with a bunch of other fine wooden axes of “the era”. When we went to the alps in late Sept '78 I took a terro adze and hammer and a bomb proof Forrest axe. Never much liked the Forest axe but the later lifetime tools were excellent. My partner took a 50 Zero and a Terro hammer. First day out, just before sunrise and prior to the Hinterstoisser my partner dropped half our rack. I thought..that aint good but we should still be OK. Lots of old fixed gear where it is needed anyway. A few pitches later he chucks his beloved Zero off and away with a good screaming fit. Fumble fingers that morning I guess. I'd left the Terro adze at the tent in the meadow. A dozen or so raps later and we escaped the wall through the Stollenloch window. Which was a trip all in itself. A trip into town, the tooth gets fixed and we head back to Cham. I walk into to Snell's looking for another bamboo Zero. Only to find overly long (70 and 80cm) bamboo tools left in the sale bin. They were cheap. I brought three home. Spent literally my last cash on hand paying duty on them @ SEATAC. I eventually cut, what I didn't sell. But by '79 I wasn't using them on technical ice. They were fun to guide volcanos with. 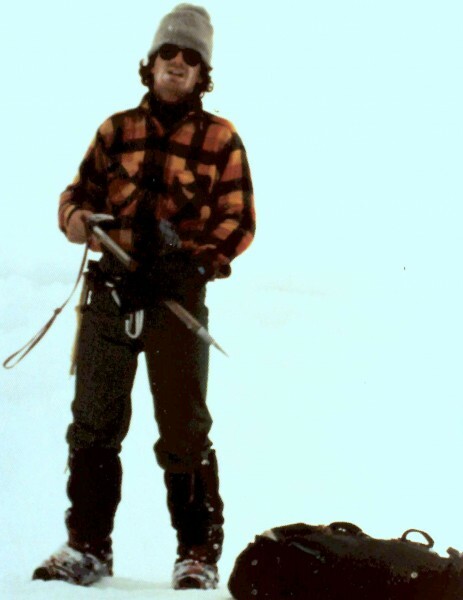 Gary Silver (rip) my partner for the 2nd Ascent of Slipstream in '80 did use a 55 bamboo piolet (basic single tooth model) and 1st Gen alpine hammer as his tools that day. Last I used a wooden shafted axe on steep ice was leading all of Takakkaw with a 50 Zero with a Chacal climbing with Kop. Hard now to appreciate just how fragile those early tools were by comparison to how badly we beat up a modern tool mix climbing. RDB: After 6 years of occasional, but sometime abusive use, my 1974 Chouinard Piolet pick had nearly been filed to the first notch. Happily, I never broke a pick off, which did happen to others while climbing ice. My axe vs a nearly unused Chouinard Piolet pick. 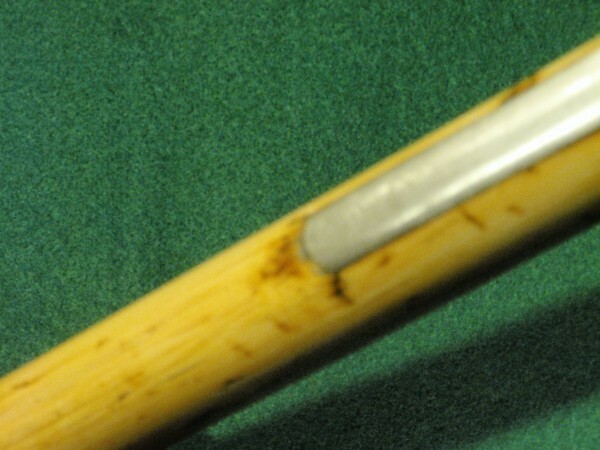 Note how close the edge of the pick is, to the first notch. My axe in the middle. Hey Fritz. That is a well used axe and a life well lived! I still have my original that went to Deborah with us. I look at my Nomics now and hardly ever sharpen them. The mixed climbing on granite just grinds them down all on its own. I get to the first tooth and generally buy a new pick for ice and keep using the old ones until they are nubbins. But I don't take a file to them much. How things have changed! My Dad was a pretty good welder so he rebuilt my tip a few times at the end of the guiding season each year. After he passed away I used his rig and tried that trick myself. I'm not that good of welder. I need to find someone that actually knows what they are doing and have it rebuilt again. It is pretty messed up now :) I'd like it to at least look pretty hanging on the wall. Rebuild, before I "fixed it". Worked good for the limited use it was getting. Last time I used it guiding on Cascade (may be '78?) I heard a snap in the handle trying to get it out with too much force and I now have a small crack in the bamboo on the lower end on the tang. Not bad but pretty much retired the axe at that point unless it was just a snow slog. I always liked the feel of the wood until a hot, sticky trip off Rainier where I needed to bang my crampons both sides every step. (can we say anti bots now?) Bad enough on the upper steep section from the crater down I was willing to offer up my favorite axe to keep my tired conga line from a long slide down the hill. It took a toll on the bamboo. I sanded it back down some to get rid of the worst of it, filled the holes with wood putty and sealed it all up again with linseed oil. 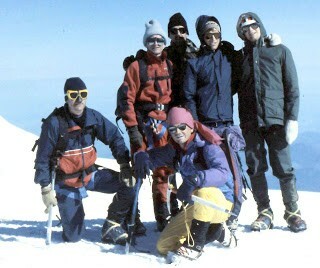 One of the last trips boot legging Rainier ('88?) I used a then new Chouinard carbon fiber version. With the same liberally wrapped cotton athletic take and glue to seal it up as I had always done to the bamboo.